The HVOF (High Velocity Oxygen Fuel) Thermal Spray Process has been developed to produce extremely high spray velocity. Rather than use thermal energy to create the plasticization of the coating feed stock, it relies on kinetic energy. There are a number of HVOF guns using different methods to achieve high velocity spraying. One method is a high pressure water cooled HVOF combustion chamber and long nozzle. Fuel (kerosene, acetylene, propylene and hydrogen) and oxygen are fed into a chamber, where combustion produces a hot, very high pressure flame which is forced down a nozzle to increase its velocity. Powder may be fed into the HVOF combustion chamber under high pressure or fed through the side of a laval type nozzle where the pressure is lower. Another method uses a simpler system of a high pressure combustion nozzle and air cap. Fuel gas (propane, propylene or hydrogen) and oxygen are supplied at high pressure, combustion occurs outside the nozzle but within an air cap supplied with compressed air. 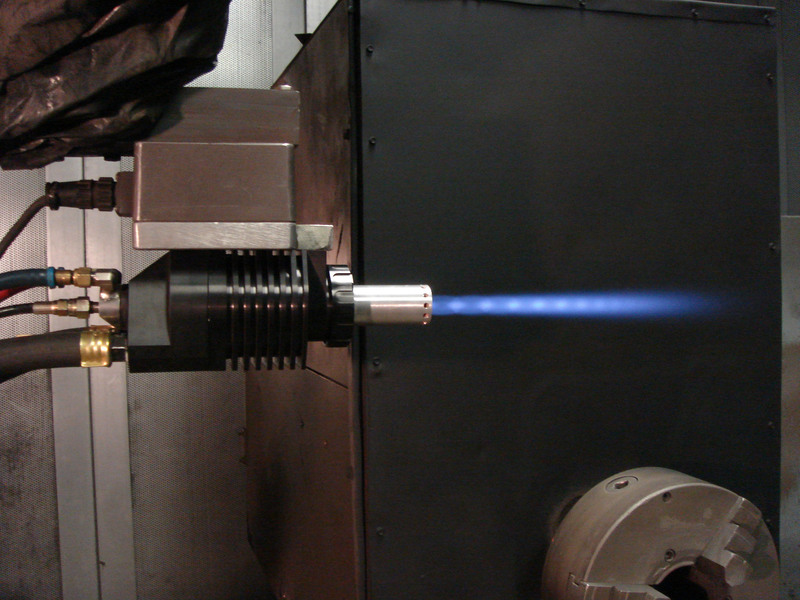 The compressed air pinches and accelerates the flame and acts as a coolant for the HVOF gun. Powder is fed at high pressure axially from the centre of the nozzle. The coatings produced by HVOF are similar to those produce by the detonation or commonly known as a “D-Gun® process. HVOF coatings are very dense, strong and show low residual tensile stress or in some cases compressive stress. The very high velocity causes the kinetic energy of the particles striking the substrate surface to transfer to the substrate. This means that the particles do not have to be fully molten to form high quality HVOF coatings. This is certainly an advantage for carbide cermet type coatings and is where this process really excels. HVOF coatings are used in applications requiring the highest density and strength not found in most other thermal spray processes. New applications, previously not suitable for thermal spray coatings are viable.